TDRUM TRIGGERBALL BEATER – Do you like playing tennis ? Today I would like to introduce the TDRUM TRIGGERBALL BEATER to you. This beater is designated to use with mesh head bass drum pads. It’s not a rod with mounted tennis ball. The size is smaller and the ball is of a softer material. Previously I used a wooden beater together with the mesh head bass drum. Four weeks ago I changed to the triggerball beater and I’m absolutely happy with it. There is no need for a protection dot / falam slam patch or an extra slice of funky foam directly beneath the mesh head. My bass drum pad is converted in the same way as the snare and tom pads. The shape of the bass drum mesh head is unchanged after this month. The rebound is fantastic and enables very fast play. At first I expected more rebound together with the mesh head, but it isn’t. I noticed the “double rebound” annul each other. Furthermore “bouncy beater play” is supported like playing on an acoustic bass drum. Also the feeling is very realistic and comparable like felt beater to acoustic bass drum. I have no trigger problems at all. Sensitivity needs a higher value. In addition the triggerball beater is very quiet and produces less impact noise which is very useful for practicing at home. - One e-drummer reported about red fluff inside the mesh head. He blew it out. The size of the triggerball beater is bigger than normal beaters. You can bend the rod a bit to fit. Re: TDRUM TRIGGERBALL BEATER – Do you like playing tennis ? Looks like a good idea. Is it small enough for double beaters? the triggerball diameter is 5cm / 2 Inch . That's the reason why I mentioned inside the post: "You can bend the rod a bit to fit." Notice in the specs they state the balls are 2 inch in diameter. I would bet they are pretty close to the same thing. the tennis ball looks the same….and I think you revealed TDRUM’s secret of making the triggerball. Thanks a lot for your research. Gerdy, you stated that the material is "softer" than an original tennis ball. IIRC I have seen such TDRUM balls on a show and my initial optical impact was that it was rubber. Is that correct? you and Hellfire made me thinking about it and I just went over to my drum kit. I removed the rod of the triggerball and looked inside. Yes vaikl, you are absolutely right. It is a full rubber ball. It is not empty like a tennis ball. The rubber ball is coated with a surface similar to a tennis ball. yes, it looks very familiar to me. Well Hellfire, I would like to invite you to the “First Unofficial Triggerball Tennis Championship” ….using our bass drum pads as rackets. Any idea how these are on the Alesis Real heads? i know Gerdy said they are made for mesh heads but im interested on how they would perform on a normal skin. I think these are the same as I buy for my dog. You can get them at any pet store in many colors. 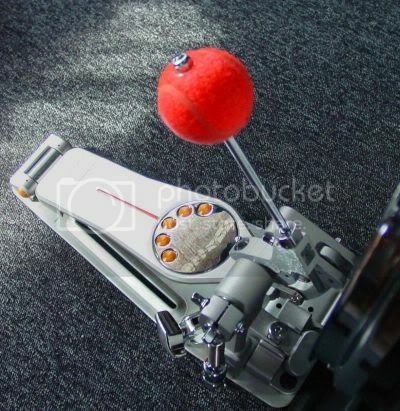 On a DW type pedal you could adjust the rod angle so you wouldn't have to bend the rod. How would you stop it from sliding down the beater rod though? Duct Tape maybe? To give it a first try you can use duct tape. But be careful that the ball is not sliding down or up and you hit a hole with the rod into your mesh head pad. a.) to cut a thread onto the rod and afterwards you are using 2 nuts and 2 washers to fix the ball in between. b.) you are using 2 washers and 2 retaining screws. 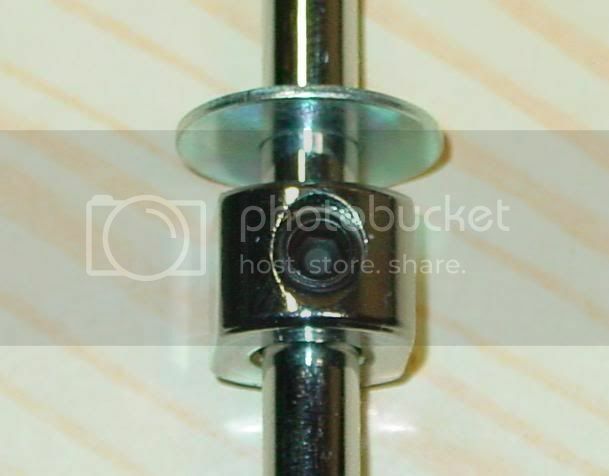 Some drum beater rods come with square drive retaining screws and are provided as spare parts. I bought this drum beater, and I am very happy with it. I tried a couple of other drum beaters, and got issues with hits not always registering. This beater simply works flawlessly with my converted mesh head. Gerdy, as always, you are hired!